When the Yankees decided not to bring back Joe Girardi as manager last fall, they knew the stakes for his replacement. Girardi had just guided the Yankees to the seventh game of the American League Championship Series. His successor would be measured by that standard. Now the Yankees and their new manager, Aaron Boone, are facing postseason elimination at the hands of their rivals, the Boston Red Sox. The Red Sox clinched the A.L. East title at Yankee Stadium in late September, and if they win Game 4 of this division series on Tuesday, they will celebrate again in the Bronx. Boone is long retired as a player, so he cannot hit a series-saving home run against the Red Sox this time. But he might have made a series-turning decision in Game 3 on Monday by sticking too long with starter Luis Severino and by turning to Lance Lynn — ignoring his deep stash of power relievers, including Dellin Betances and David Robertson — in the fourth inning of an eventual 16-1 fiasco. The Yankees have lost 163 postseason games in their history, and this was the most lopsided. 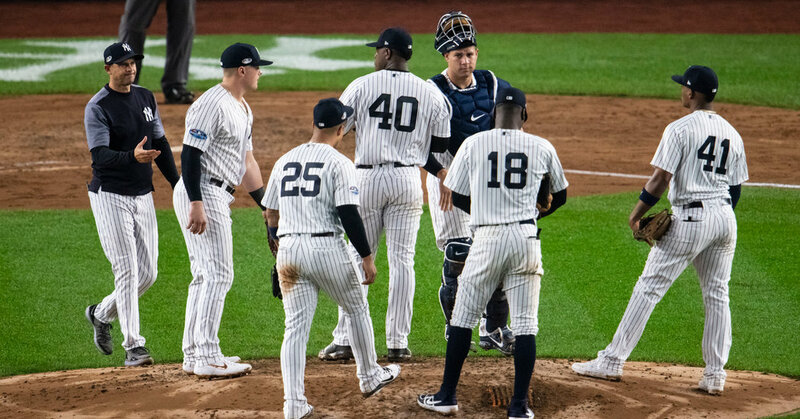 By the end, with no mound visits remaining and an overmatched Stephen Tarpley having already pitched, Boone summoned the backup catcher, Austin Romine, to mop up. Romine threw 90 miles an hour and got two outs — but then allowed a walk and a two-run homer by Brock Holt, who hit for the cycle. There is a reason that only one other position player — Toronto’s Cliff Pennington, in the 2015 A.L.C.S. — had ever pitched in the postseason. The games are rarely so farcical. General Manager Brian Cashman, who let Girardi go after 10 seasons and 910 victories, made the decision last winter to hire Boone, who had the baseball acumen through a deep and proud family lineage in the game, and strong communication skills he honed as a broadcaster. Boone, 45, would be relatable to players and open to the Yankees’ emphasis on analytics. All Boone lacked was experience as a manager or a coach. Cashman believed he would grow into the job. Boone led the Yankees to 100 victories in the regular season, plus another in the wild-card game against Oakland. By all accounts, he is part of a seamless organization, with the baseball operations department and the dugout staff working harmoniously. The players like him, and he presents the team well with the news media. All managers make mistakes. Girardi failed to use a challenge in a division series game in Cleveland last October, leading to a loss. Did Boone let the game speed up on him in the early moments of Game 3? It is a fair question, especially because the Yankees do not have an experienced bench coach alongside him, either — Josh Bard, Boone’s former teammate in Cleveland, had also never been a manager or a bench coach before stepping into the role this year. Boone does have a veteran pitching coach, Larry Rothschild, and between them all it is hard to fathom why Severino was allowed to stay in to start the top of the fourth. The Yankees were trailing, 3-0, and it could have been worse. The Red Sox were blistering nearly everything Severino offered, a point Rothschild did not contest. Considering Severino was not sharp in the third, why did the Yankees let him return for the fourth? Rothschild pointed to the hitters Severino would be facing, and to his track record — factors that apparently overrode what he and Boone were observing in the moment. The TBS broadcast raised the issue of Severino warming up too close to game time, but Boone, Rothschild and Severino insisted he went through his normal pregame routine. But he looked vulnerable from the start, when Mookie Betts launched his first pitch, a 96-mile-an-hour fastball, to the warning track in center field for an out. Two more deep drives also expired on the track in center. Even so, Boone believed Severino could handle the fourth. It would start with Holt and Christian Vazquez, who were added to Monday’s lineup in a shake-up by Manager Alex Cora that surprised even Holt. Cora was sure, all right, and Brock delivered a single to lead off the fourth. Vazquez followed with another, then Jackie Bradley Jr. walked. No starter this postseason had allowed six runs; managers have become increasingly aggressive in deploying relievers at the first sign of danger — or even before, more as a peacekeeper than a fireman. But Boone took a risk when he let Severino last so long, and he made a strange choice to keep the runners where they were. After Lynn allowed all of them to score — first with a walk to Betts, then with a double to Andrew Benintendi, who cleared the bases — Severino had been charged with six runs in just three innings. Lynn lasted only four batters before Chad Green took over. He was not much better. Using Lynn in that spot was a curious decision. He was essentially a league-average starting pitcher this season — a little worse than average for Minnesota, a little better than average for the Yankees. He had a high strikeout rate — but also a high walk rate — and his earned run average was 4.77. In the regular season, you could understand using a long reliever to save the power arms. But here? In the playoffs, with a hot Boston lineup unplugging a frothy Bronx crowd? The moment called for urgency, and Boone showed none. Lynn held right-handers to a .239 average this season, and he had held the left-handed Benintendi to two hits in 11 career at-bats. But even at his best, he is not Robertson, who has made a career of wiggling free of jams. Robertson was available. So were Betances, Green, Zach Britton — or any reliever. Lynn is usually a starter, and while he pitched two scoreless innings of relief in Game 1, any other reliever would have had more experience entering a game with the bases loaded. Managing experience was not required for Boone to be the Yankees’ manager, and extensive bullpen experience was not required for Lynn to take over a playoff game in peril. Now the Yankees’ season is in peril, too.